Fresh honors have been bestowed upon engineering faculty member Melody Baglione, who has been teaching mechanical engineering at Cooper Union for almost six years. She has received the prestigious Ralph R. Teetor Educational Award by the Society of Automotive Engineers (SAE) for her commitment to engineering pedagogy and innovative approach to curricular programs. Professor Baglione received The Ralph R. Teetor Educational Award as a result of her broad efforts in instructional, research, and service activities while at Cooper Union. She has advised undergraduate and graduate automotive-related projects, directs both the Mechatronics and Controls Laboratory and the Vibrations and Acoustics Laboratory, and continuously incorporates real-world industrial applications into her classroom projects. Professor Baglione’s grant from the National Science Foundation (DUE #1044830) allows her to integrate sustainability practices in her control systems course. Professor Baglione’s students examine the environmental impact of our LEED Platinum-certified green building at 41 Cooper Square, the home of the Albert Nerken School of Engineering, and thereby using it as an instructional resource. This award also aims to recognize those who serve society through engineering outreach. Professor Baglione has established a diversity program through continued grants from the American Society of Mechanical Engineers (ASME). Through this program, she and her students created an Interactive Light Studio and are developing engineering solutions to teaching hearing-impaired children about science, technology, engineering, and mathematics (STEM). Professor Baglione accepted the Teetor award at the annual Society of Automotive Engineers Congress in Detroit in April 2013, and spent several days networking with others in the field. 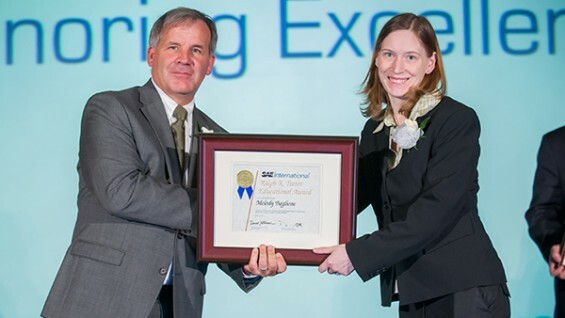 "I am honored to receive the SAE Teetor Award," says Baglione, adding that as a recipient she was "afforded an invaluable opportunity to network with industry professionals and academics from around the world." Prof Baglione has previously received an Outstanding Presenter Award from SAE and continues to publish in journals and regularly presents at conferences for SAE and ASME.